French rosés, like Endless Weekend, are great when a dish’s sauce is heavier than what a white wine would call for, but not quite right for a full-on red. Consider a rosé wine with seafood when grilling tilapia or tuna steaks. Rosé also is a good choice with a tomato-based seafood soup, such as cioppino or zuppa da pesce. To know more about Endless Weekend check our Instagram and Facebook. For a high-protein, gluten-free dinner recipe, try this tasty seared Tuna with Fruit Salsa. Serve over quinoa or brown rice to please heartier appetites. Lightly brush tuna steaks and peach halves with olive oil; sprinkle with salt and pepper. Cook tuna and peaches in a skillet over medium-high heat for 5 minutes. Remove peaches; set aside to cool. Turn tuna and cook 6 to 7 minutes more or until it flakes easily when tested with a fork. Transfer tuna to a platter; cover to keep warm. Coarsely chop peaches. In a medium microwave-safe bowl heat, apricot preserves on 100 percent power (high) for 15 seconds. Stir in vinegar; gently fold in raspberries and peaches. 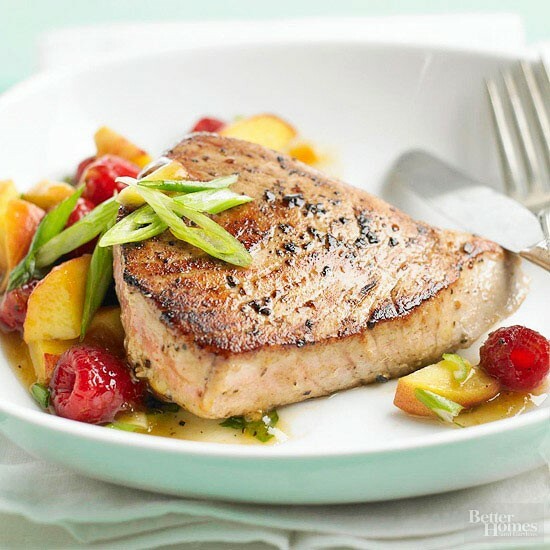 Serve fruit salsa with tuna steaks and sprinkle with green onions.